Do all your defenders make the same type of tackle every play? Even within a position group, each player makes different types of tackles. This could be due to spacing, timing, relation to other teammates, assigned run fit and the opponent’s formation or play call. Still, patterns emerge. At least it did for Bridgewater College and their defensive coordinator, Coach Everett. Coach Everett felt his safeties made the same type of tackle routinely, but it was a gut feeling. So he started to look at their data. If this had been the 2017 season, he quickly would have discovered that the results weren’t good enough because in 2017, Coach Everett didn’t possess the data to make that conclusion. While he could recognize visual patterns that emerged, he didn’t have the ability to analyze his observations. He graded players on either making or missing a tackle but held no additional information that tracked the type of tackle each player made. Luckily this past off-season, Coach Everett learned how to track that data by attending an Advanced Tackling System event. At that event, a special preview from USA Football, Richie Gray and Andy Ryland detailed every component of the Advanced Tackling System, which is changing the way high school and collegiate teams view tackling. One component discussed was analytics. Within this discussion, coaches learned how the Advanced Tackling System could help their staffs implement metrics to plan better practices that enhanced the most important defensive skill – tackling. Here’s a glance at what was instructed. When most coaches grade a player’s tackling, they generally assign a positive or negative score. A missed tackle often yields a negative score. With the Advanced Tackling System, coaches are asked to assess another detail – the type of tackle. Whether the defender properly brought the ball-carrier to the ground or not, coaches need to assign the type of tackle. For instance, if it was a perfect form tackle, that should be indicated in the grade. If it was a failed thigh and drive tackle, that should be noted as well. What does this give you? By analyzing the tackle type, you can determine what tackles you need to prioritize each week in practice. This is what happened with Coach Everett. This past season, he was able to see that about 30 percent of his safeties’ tackles were of one specific type. However, during his team’s tackling sessions each week, he found his safeties weren’t practicing that type of tackle in with anywhere near that level of frequency. As such, Coach Everett adjusted his practice plans to ensure his safeties were practicing that type of tackle at nearly the same rate that they were forced to execute it each game. Grading the film by tackle type can seem like a lot of work, but there are plenty of ways to streamline this process. First, you can assign a “tackle coach” that’s tasked with grading every tackle or missed tackle in the game, by player. This can be an assistant or someone with a lesser schematic workload. Another alternative is to have each position coach grade the tackles that his players executed or attempted to execute during the game. For most coaches, that’s only 20 to 30 additional box checks per game. Specifics on how to handle this in the most effective and systematic way to deliver positive results for your defense will be covered at length in the Advanced Tackling System. While Coach Everett noticed a pattern with the type of tackle his players executed, he also needed to understand why they succeeded or failed. It’s important to be able to diagnose the real reason why your players failed to make a tackle. Simply grading it as a “make/miss” isn’t good enough for the most important defensive fundamental and won’t deliver your desired results. Does your offensive line coach say, “Missed block?” No. They usually explain why. “High pad level. Slow get off. Poor finish. Wrong assignment. Bad hand placement.” And because an offensive line coach is communicating to five or six players, he often uses consistent language too. When it comes to grading tackling, the same level of detailed explanation and consistent language is also necessary. For instance, two linebackers might have both missed a tackle. But the first one was because the defender took a bad initial angle while the second tackle was missed because the player didn’t drive their feet through the finish. Simply practicing “form tackling” all week won’t fix that problem, though it provides a starting point. As you assign tackle types, you need to assign points of failure. 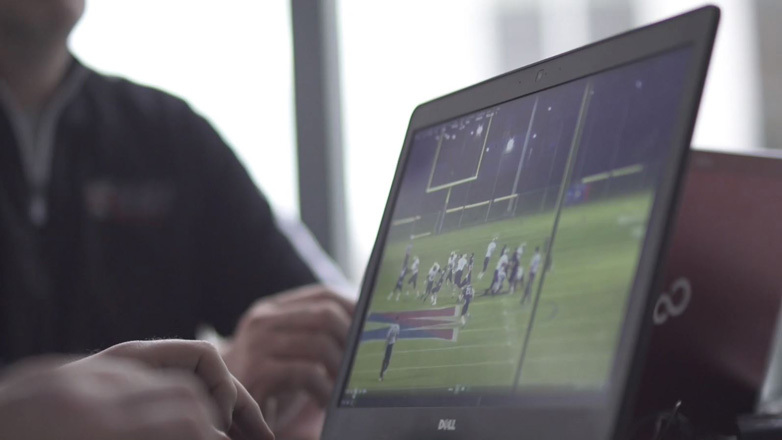 To measure this accurately, whoever is grading this part of your film – either one coach or position coaches – needs to use the same vernacular to ease analysis and help provide valuable feedback to the players. When using the same language on every graded tackle, the results become easily sortable and it’s easy to recognize the most common flaws over the course of the season, something missing when most coaches just anecdotal player notes in the play data. The Advanced Tackling System offers specific points of failure that apply to any type of tackle. What’s great is coaches can stay as high level as they need depending on their time resources and level. RELATED: Hear about the Advanced Tackling System on the Coach and Coordinator Podcast. For example, if a small staffed high school can only capture the high-level data points, it’ll still be helpful. Through that data, they can shape a better tackling session during practice. If more resources are available, then that staff can provide even better feedback and build better plans by digging into specific Key Performance Indicators (KPIs). Within the Advanced Tackling System, these KPIs and points of failure are tied together with specific drills and techniques that can be applied to any system of tackling you use. That’s what makes the Advanced Tackling System so powerful. From the instruction you give your players to the drills you implement to the analysis and practice planning, it all works together. Whether you pursue the Advanced Tackling System or not, we hope this helps you think about tackling differently. While the Advanced Tackling System will give you a progressive and thorough framework for every element of tackling, implementing this approach will help your team achieve better results and improve the skills of your staff and players.